By Aaron Sharockman on Tuesday, January 14th, 2014 at 10:10 a.m.
Chris Hayes hosted an 11 p.m. live special on MSNBC to discuss Gov. Chris Christie. MSNBC devoted almost every minute of open programming Monday night to coverage of Gov. Chris Christie, while Fox News largely sidestepped Christie talk. 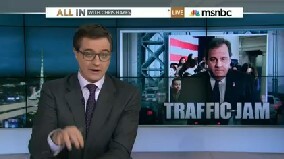 From 5 p.m. to midnight, MSNBC spent 211 minutes on Christie, highlighting reports and emails suggesting Christie aides closed lanes of traffic as part of a political imbroglio, raising questions about a TV ad paid for with Hurricane Sandy relief money and debating Christie's future political prospects. It would have been more, but MSNBC’s Chris Hayes previously had planned an 8 p.m. special to discuss the 50th anniversary of the war on poverty. Hayes did return for a live 11 p.m. show, where he spent all 41 minutes of programming discussing Christie. Excluding Hayes’ 8 p.m. special, MSNBC anchors spent only 30 minutes over seven hours Monday night talking about anything other than Christie. (About 20 minutes of each show is commercials). Al Sharpton and Lawrence O’Donnell both devoted their entire show to Christie. Here’s how Sharpton opened Politics Nation: "Tonight’s lead, the Christie investigation widens and the pressure is rising. Since Gov. Christie's press conference, it hasn’t quieted down. It’s only getting hotter." PunditFact looked at the minute-by-minute breakdown of MSNBC and Fox News programming Monday night. The difference in programming choices Monday was stark, though not unexpected. While MSNBC repeated Christie stories hour after hour, Fox News spent 50 minutes talking about Christie from 5 p.m. to midnight. More than half of that time was thanks to Bill O’Reilly, who interviewed Republican strategist Karl Rove and Fox News political commentator Brit Hume. The segment ran for 14 minutes at 8 p.m., and re-ran at 11 p.m. -- totaling 28 minutes. "Any time there is somebody who is at parity with Hillary Clinton or near or ahead of her as Christie has been in recent polls, the Democrats are going to, in my opinion, seek opportunities to knock him down a notch or two, and they had an opportunity with this bridge closing to knock Christie down a peg or two and they jumped on it," Rove said. On The Five, co-hosts discussed former Defense Secretary Robert Gates’ memoir, the Golden Globes and the suspension of New York Yankees third baseman Alex Rodriguez, but they did not cover Christie. Bret Baier at 6 p.m. spent four minutes discussing Christie. Greta Van Susteren started her 7 p.m. show with news of new Obamacare enrollment figures. She spent one minute, 7:18 p.m., on Christie. Megyn Kelly told viewers she decided to focus on stories other than Chrisie during her 9 p.m. show. Sean Hannity had a pair of conservative pundits talk about Christie for eight minutes. Attorney David Limbaugh talked about a double standard in the mainstream media. "It's one thing what Christie has done on a much smaller scale than the millions of things Obama has done wrong, the countless abuses of power he's engaged in, and the media doesn't even so much as ask a question." CNN, meanwhile, spent 53 minutes discussing Christie and/or Bridgegate Monday night. Crossfire ignored the topic while Piers Morgan had panelists talking about Christie for 17 minutes. Anderson Cooper aired just four minutes of Christie discussion during his 8 p.m. show Anderson Cooper 360 but led off his 10 p.m. show AC 360 Later with 10 minutes of talk. The common denominator in most of the CNN discussion? Pundit and CNN political analyst Gloria Borger. Aaron Sharockman is editor of PunditFact.com. Follow PunditFact on Twitter @PunditFact.